In February of 2009, Cati O'Keefe was keeping chickens in Montgomery OH, just four doors down from City Hall. Based on her own reading of the ordinances, she believed it was legal. One of her neighbors was so enthralled with her chickens that she asked for Cati's help in setting up a coop of her own. Cati had been willing to take the risk that she'd misread the ordinances for herself, but she didn't want to advise her neighbors without being absolutely certain, so she called City Hall and asked whether it was legal to keep chickens without revealing that she was already keeping them. 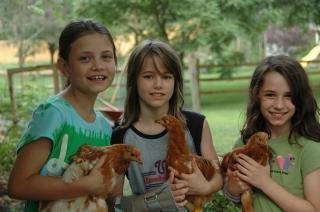 Montgomery city officials, investigating the question, discovered that chicken-keeping was indeed legal in Montgomery. Montgomery is an affluent suburb of Cincinnati, and residents are proud of their well-kept neighborhoods and very concerned about anything that might affect property values. City officials assumed that most residents would be opposed to allowing chicken-keeping. Not realizing there were already chickens being kept by Cati and others because those chickens had caused no problems, they took immediate steps to correct what they thought was an oversight and started the process to criminalize the keeping of chickens. Because this represented a change in the criminal code rather than a change in zoning, chickens currently being kept in Montgomery were not 'grandfathered' in. Our local community newspaper carried the story on April 29th, which was the first anyone heard of it. I immediately wrote a letter to our City Council asking them to reconsider, and we started organizing. We wrote our Chicken Manifesto, a research document answering as many objections and questions as we could come up with about suburban chicken-keeping, and provided it to the city's Planning Commission and to City Council. We wrote letters to the editor, started a Facebook group called Chickens For Montgomery, and started attending meetings of City Council and the city's Planning Commission. 3. Coops and enclosures must be invisible from the street, shielded from neighbors by fencing or landscaping, and adhere to setbacks and property maintenance codes. At the same time, City Council scheduled a Public Hearing and posted a question on the city website asking residents to give opinions on the issue. We publicized the Public Hearing on our Facebook page and via posts to the local chicken-keeping and local foods groups, wrote letters to the editor offering reasons why chickens should be allowed, asked supporters to chime in at the city's website, and answered questions from the media. The Public Hearing was well attended, with over fifty in the audience. Several audience members spoke in support of allowing chicken-keeping and no one spoke against it. The city's website received over sixty comments, which were 3-1 in favor of allowing chickens. The new ordinance required three public reading before it became law, and at each meeting of City Council we showed up to answer questions and make comments, but no member of the community showed up to express opposition. On December 2nd City Council reversed itself and made chicken-keeping once again legal in Montgomery. It's my strong feeling that this success can be replicated in other towns. If Montgomery, an upscale suburb of a conservative Midwestern town, can take this progressive step toward allowing residents to live a more sustainable suburban lifestyle, I believe success is possible anywhere. I believe it's a matter of approach. 1. Treat city officials respectfully. Do NOT take an adversarial stance with your city council. Use "We" instead of "You" or "They" whenever you talk to or about them. "We should reconsider this," rather than "You should" or "They should." Your government is YOU. They represent you and other residents of your town. You and other residents elected them, and they're very aware of it. In all likelihood, they all are well-intentioned people doing their level best to represent their constituents to the best of their ability. Treat them as if they're on your side, keep your sense of humor, and they likely will, too. If they feel besieged, they'll likely dig their heels in. Once people have chosen a 'side' it's hard to switch teams, so don't let it become two opposing sides. Always approach it with a 'we're all in this together trying to find a solution that will work for everyone' attitude, and they likely will too. I'm leery of approaching the media except as a last resort (it might make council feel besieged), but if the media approaches you, use your "We" words. "We as a community should reconsider this for (blah blah blah reasons) rather than "They just aren't listening," etc. See if you can find a champion on council. Attend some meetings and listen to arguments between the members, see if you can identify someone who is environmentally conscious or concerned about people surviving the down economy. If you can find a champion on the inside (as long as they aren't always the odd man out) that's a very powerful tool. Ask that person for advice. 2. Do your research. The more research you do, the less your city's staff will be burdened with doing. And if you do the research, you can be sure it's complete and accurate. We produced a research document called Chickens For Montgomery (or the Chicken Manifesto as my husband dubbed it) that we are happy to have you download, edit to reflect your own area, and use as you wish with our blessings. 3. Gather support without generating opposition. Organize! One of the best things you can do is, when you approach Council, have your research document ready with your contact information prominently included. Find out the procedure and rules for addressing council -- usually you have to sign a card or form, turn it in, then you have three minutes or something. If there's a podium/microphone for citizen input, go to it and state your name and address. Ask that "WE" reconsider the idea of allowing "chicken-keeping for purposes of household egg-gathering" as it's a way for people to raise a little of their own food in an uncertain economy and a way to live a more sustainable life in the city. Tell them you have some research you'd like to provide on the issue. Tell them that chickens are currently legal in other nearby, similar areas and that those communities aren't experiencing problems with their chickens and have no plans to change their laws. When the buzzer sounds, thank them, ASK WHAT YOUR NEXT STEP SHOULD BE, give their clerk copies of your document, enough for all council members, and sit down. They probably won't look at it then, but they'll get it and many of them will look at it over the next few weeks before the next meeting. If you can bring multiple supporters with you, do it. They don't have to talk, but just being there (and looking like solid, responsible citizens rather than nutcases ) will help. Then attend the next meeting and if it isn't on the agenda ask politely if they've considered the issue. If they agree to consider it, THAT's when you want to get the major support out. Attend every meeting, whether it's a business or a work session. Get others to attend, too. Ask people to write letters to council. If it gets referred to a Planning Commission, attend those meetings and give them your document. If they decide to address it, there'll probably be a public hearing -- drag as many warm bodies there as you can -- and you'll want to have lots of people writing letters to the editor of your community paper. Using the media is tricky. On one hand, they can be very helpful in getting the word out to supporters. On the other, remember that the media is looking for a juicy fight with namecalling, and you have no control over how they'll slant their story. If they approach you for a quote, be very sure your quote is non-adversarial. Saying things like, "This is the stupidest thing I've ever heard" or "Some people just want to control what other people do" will not help you maintain a non-adversarial relationship with your city officials. You need them on your side. You also need to get members of the community who might be leery of chickens on your side, or at least to remain neutral. An organized opposition is much more difficult to overcome than one that hasn't been galvanized to action. You don't want to say anything to the media that will make readers of a story think, "These people are nuts! I'm going to attend the next city council meeting!" Best of luck to you with your chicken fight! If you'd like to hear more about our experiences or ask questions, please do!